James Cahill summoned a steely final two frames to recover from an Andrew Higginson fightback and win 10-9 at Betfred World Championship qualifying. Former professional Cahill, who is competing as a Q School top up, had led 7-0 during a superb first session display. He also took the opening frame this afternoon with a break of 118, to move 8-2 in front. However, it was from that moment that 2007 Welsh Open runner-up Higginson mounted a spectacular comeback charge. Higginson composed breaks of 59, 66, 62 and 52 on his way to seven on the bounce to claim an unlikely 9-8 lead. Cahill then showed great character to turn the tide of momentum and win a tightly contested 18th frame. He went on to secure victory in the decider, making a break of 56 to take the crucial frame and book a second round meeting with Michael Holt. The significance of Cahill’s win is heightened by the fact that it keeps his hopes of regaining professional status this week alive. The Blackpool potter is currently in position to earn a tourcard via the one-year money list. However, he will have to wait and see how the remainder of the event unfolds before his place on the circuit is confirmed. 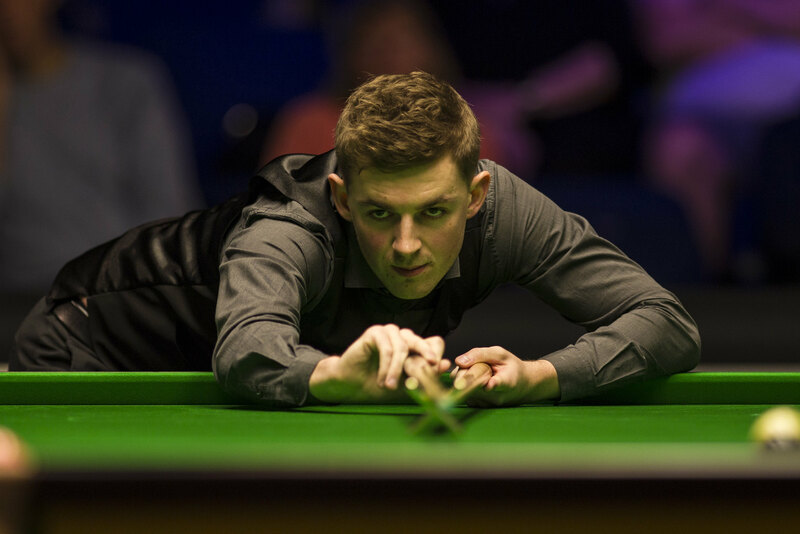 Cahill is also now just two wins away from becoming the first amateur to qualify for the Crucible. “I played really well yesterday, but today was just a different game. He played well and I don’t think I did that much wrong to go 9-8 down,” said 23-year-old Cahill. “It’s just a bit of a shame that we had to play each other, because we are good friends off the table and practice together, it was a tough draw for us both. “I think I showed a lot of character having been 7-0 and 8-2 up and then 9-8 down. I think it takes something special to then come back and win from there. Hossein Vafaei blitzed to the finish line with five consecutive frames to beat China’s Zhang Anda 10-4. Vafaei is bidding to become the first ever Iranian to qualify for the Crucible. He has come close to achieving the feat over the last two seasons, having lost on Judgement Day both times. The world number 36 held a slender 5-4 lead coming into this afternoon’s concluding session. Despite the close scoreline, he rapidly pulled away from his opponent today. Vafaei hammered in contributions of 96, 83, 55 and 75 to take a clean sweep of the frames and ease to the 10-4 win. Liang Wenbo produced a break building masterclass to inflict a 10-0 defeat on Egypt’s Basem Eltahhan. The Firecracker compiled breaks of 52, 133, 72, 119, 114, 53, 65, 56 and 50 on his way to an imperious victory. Dominic Dale took a huge step towards tour survival with a 10-5 win over Scotland’s Chris Totten. The two-time ranking event winner had to win today to keep his hopes of remaining on the circuit alive. Defeat for Totten means he loses his professional status. Rory McLeod suffered relegation from the circuit after a 10-8 loss against amateur David Grace, who will be on the tour next season after qualifying through the Challenge Tour. Indian Open champion Matthew Selt won four frames in a row to defeat Welsh amateur Dylan Emery 10-3 and book a second round meeting with Anthony Hamilton. 2017 German Masters winner Hamilton solidified his place in the world’s top 64 with an important 10-9 victory against Thai legend James Wattana. While Thailand enjoyed a better result with Noppon Saengkham’s 10-3 demolition of Adam Stefanow, which he clinched with a stunning 146 break in the last frame. Ricky Walden came through a hard fought contest with Alfie Burden 10-7 to progress to the second round. He faces Eden Sharav up next, who defeated amateur David Lilley 10-7.